Recipe-in-a-Jar Gifts are delicious, versatile, and popular gift ideas for just about any event. It’s easy to choose a favorite cookie recipe and layer the necessary dry ingredients in a wide mouth mason jar. Attaching colorful, personalized recipe instruction tags make these sweet treats all the more memorable for their recipients. The result is perfect for showing appreciation to clients at holiday time, or as extra-special surprises for friends and family. Need tasty recipe ideas or special custom hang tags? Drop an email to Graphic Arts Studio for more information! 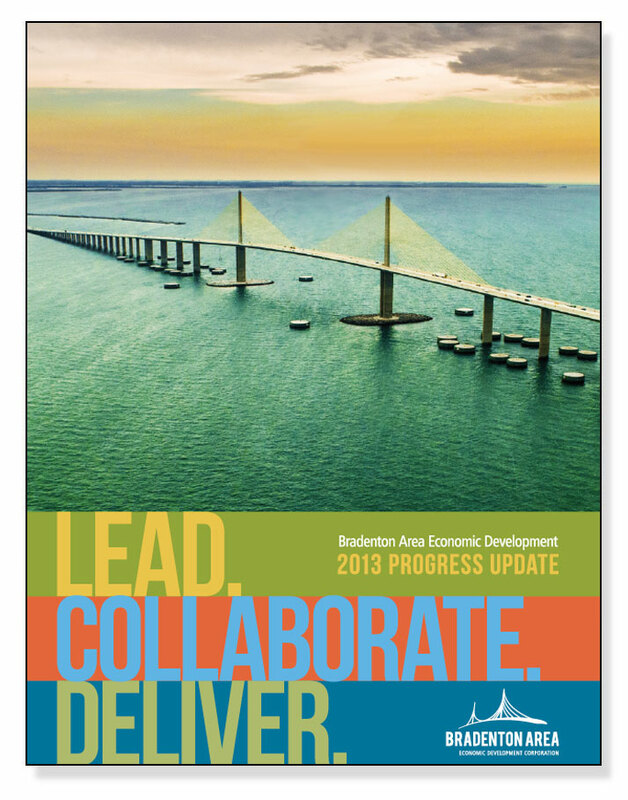 Momentum keeps growing for the Bradenton Area Economic Development Corp. (EDC)’s “Build Bradenton Area Plan”. The EDC issues an annual Progress Update brochure that showcases results from the organization’s work to create a more diverse and sustainable economy in the Bradenton Area. At this year’s Bradenton Area Economic Development Corp.’s Progress Update Luncheon, attendees were greeted with these memorable (and tasty!) treats. Customized chocolate candy bars were created to highlight the EDC’s growing progress on bold initiatives to expand economic opportunities for local residents and existing businesses in the Bradenton area. Playful copy encouraged attendees to “Take a bite” and visit the EDC website for more information on how these initiatives are shaping Manatee County’s future as the business address for the South Tampa Bay region. Logo and advertising design to promote awareness and provide information for the Manatee County, FL Half-Cent Sales Surtax for Public Infrastructure request on the November, 2016 ballot. The county needed to create a new revenue stream to reduce the vast reliance on property taxes to fund projects and programs that benefit the public. Voters said “yes” to this local tax referendum, which is expected to cost a typical household about $5 a month in county sales taxes, but raise a total of $30 million a year in revenue for improvements to county infrastructure. Transportation infrastructure improvements, including upgrades to the current standards for travel lanes, sidewalks, bike lanes and lighting; the replacement and expansion of aging public safety and law enforcement facilities and equipment; and upgrades to county parks and community amenities are now being scheduled. Full book design for “Interpersonal Hypnotherapy” by Matthew Brownstein, CCHt. Created for Anahat Education Group/International Association of Interpersonal Hypnotherapists (IAIH), this is the first book in a series of totally redesigned products from their catalog. Through public awareness, high ethical standards, compliance with Federal and State standards of education, transparency, continuing education and synergistic growth, IAIH works to lead the way in global transformation through honoring the importance of relationships in every aspect of the human experience. Full book design of “Shining Leaf: Miracles Along the Path to Peace” by Sara Linda Long, CCHt and IIH Graduate. Within these pages, Sara Linda Long explores her life journey, her journey through “A Course in Miracles” and her deeply personal transformations at the Institute of Interpersonal Hypnotherapy. The Bradenton Area Economic Development Corporation (EDC) is the lead economic development organization for the Bradenton Area’s nine communities located on the south side of Tampa Bay. The EDC works to diversify the local economy by attracting and retaining high-wage jobs for area residents, and connecting existing businesses to the resources they need to succeed. Click for full online Directory. The EDC’s multi-year strategy for bringing greater diversity to the Bradenton Area’s economy aligns the community’s assets with business sectors that already have a foothold in Manatee County. They work daily with local and state governments to smooth the way for business expansion, including helping businesses apply for economic development incentives and rapid response permitting, and work to connect growing businesses to resources for international trade, entrepreneurial development, workforce and much more. To help address concerns related to land use planning and future development of Longboat Key, the Town contracted with the nonprofit Urban Land Institute (ULI), a research and education organization known for providing expert advice to shape better communities. The ULI recruited a panel of experts to address questions developed by Town residents and staff, interview diverse representatives from Longboat Key, and provide recommendations to the Town. The panel’s work, conducted during the third week of October 2013, culminated in a public presentation of ULI recommendations to the Town Commission on October 25. Read more about the project. Jay started ISI in 1996 and has built it into a $25-million company with 51 employees and offices in Memphis, Nashville, Chattanooga and Knoxville, as well as Birmingham, AL, Oxford, MS, and Little Rock, AR. A natural storyteller, Jay is a sought-after speaker at CEO conferences and entrepreneurial development programs where he shares inspiring stories and practical tips based on growing ISI from $11- to $25-million during the Great Recession. Jay’s message as detailed in his second book, Hitting the Curveballs: How Crisis Can Strengthen and Grow Your Business, reveals creative, practical strategies to achieve business success in difficult times. His website can be found at JayMyersCEO.com. When the Exeter Teachers Association unified, their leadership requested a new, highly-stylized logo that would incorporate both the education theme and a representation of their area’s famous landmark, the historic 1912 Exeter Water Tower.